Meditation originated out of some Eastern religions, and has been practiced for thousands of years. With the increase of stress and being overwhelmed, many countries have adopted the idea of meditation and have been using it in order to personally develop. How do you meditate at home is a question that many ask themselves, since not everyone who can benefit from meditation is able to take time out of their day to drive somewhere and meditate. Meditation mildly depressed that you try to find a teacher with whom you can work closely. when someone depressed it can be challenging to learn new skills, and the depressive tendency to focus on what’s wrong can lead to feelings that the meditation isn’t working, even when it is. You may need an experienced coach to help you work with your frustration. Although such opportunities are unfortunately very rare, an experienced meditation teacher who is on hand to give you step by step guidance can probably helps you even when you are experiencing severe depression. When preparing a home meditation area, many thought that they were going to have to spend a great deal of money. In reality, one can actually use items they have already in their home. Some type of rug or floor mat should be placed down, so you have your designated home meditation area and also since you will be on the floor. You can also include a pillow if you like, for additional comfort. A small CD player or other type of music player can be used, since many like to use music to help them concentrate easier. Take into consideration that there is no right or wrong way to meditate, so you can include whatever works best for you in your home meditation area. Practicing meditation at home is much like practicing it anywhere else. While some like to meditate near water since the sound helps with the rumination process, you can duplicate the sound in your home. Buying CDs of nature sounds or even equipping your home meditation area with a small fountain works just as good, and allows one to meditate in the comfort of their own home. 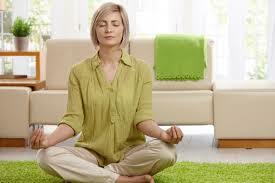 Once you have prepared your home meditation area, you are ready to meditate. You just have to make sure that there is nothing around that will distract you, because those small distractions are like a reflection of why you are meditating in the first place. How do you meditate at home? It is very beneficial to those who decide to do it, since they are able to meditate in the comfort of their own surroundings. They can save time since they don’t have to drive anywhere, and also money since they are not paying for gas or a membership to a spa. Meditating at home achieves the same results as meditating in specialized locations, so it will leave one feeling relaxed and ready to take on the world. How do you meditate at home? It’s simple. Just do it. I would suggest not trying to meditate when you are extremely depressed, and especially not at times that you are having any thoughts of self-harm. You might imagine this is as a flow of light. You are breathing in a golden white light that is illumining your being with peace, and the darkness that is your tension in all its flavours, you are letting go.